Hey guys, I recently had to replace the drivers side carb, at the time it was only running on 3 cylinders. I replaced the carb and I had to reuse the air horn from the old carb. Fast forward to today I get to drive it home from school where I'm working on it, I installed and electric fuel pump, moving it around the yard it has been running absolutely fine on the choke. As I leave today its misfiring on the drivers side, it coughs and sputters and I barely make it home. I pulled the plugs and all 3 drivers side plugs are light brown and crispy, the passenger side plugs are oily, but okay. I smell the oil and it smells like gas. Could my timing have potentially jumped? When I get more free time I'm going to pull each plug individually to check for spark but it seems odd all 3 plugs on the drivers side are junk. Pictures? What does crispy mean? Did you rebuild the carb properly, before you replaced it??? I replaced it with a fresh new carb I had. I'm going to go back through the venturi cluster again. The gas in the tank is suspect too. I'll be able to get a picture of the plugs soon. The left set of plugs are from the drivers side. Your replacement carb could be washing the cyl. walls down with fuel. Hence the oily fuel smell. Is this an LM or EM? 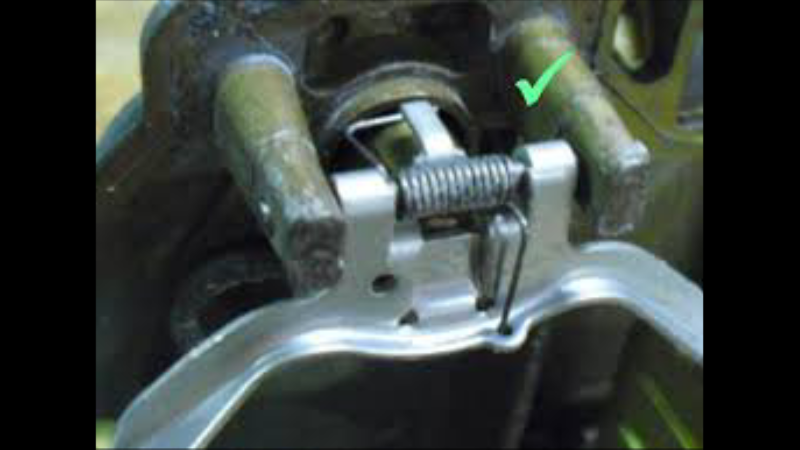 Check the float spring on the offending carb, may be in wrong place. Fairly common accident, and causes flooding. Pic is of LM carb, and spring in proper placement. Edited 1 time(s). Last edit at 02/04/2019 02:20PM by viewmaster. Its an EM. I took note of the spring when I was reassembling the carb but I will double check. won't fire at all. Can't see from your pic. Edited 1 time(s). Last edit at 02/04/2019 02:38PM by steve c goodman. Replacing the plugs with clean ones didnt help the problem whatsoever, additionally the car fires up like it was fresh out of the factory and it runs like a top when the choke and fast idle are on which is what's confusing. LH plugs look way better than the ones on the right. Those on the right are likely fouled. The carb for the ones on the right is too rich. Too much choke or too high fuel level. If oily something is bad mechanically. Edited 1 time(s). Last edit at 02/04/2019 02:48PM by joelsplace. Much earlier this year I over filled the oil and it puked it out through the PVC. I was expecting all 6 to come out soaked. 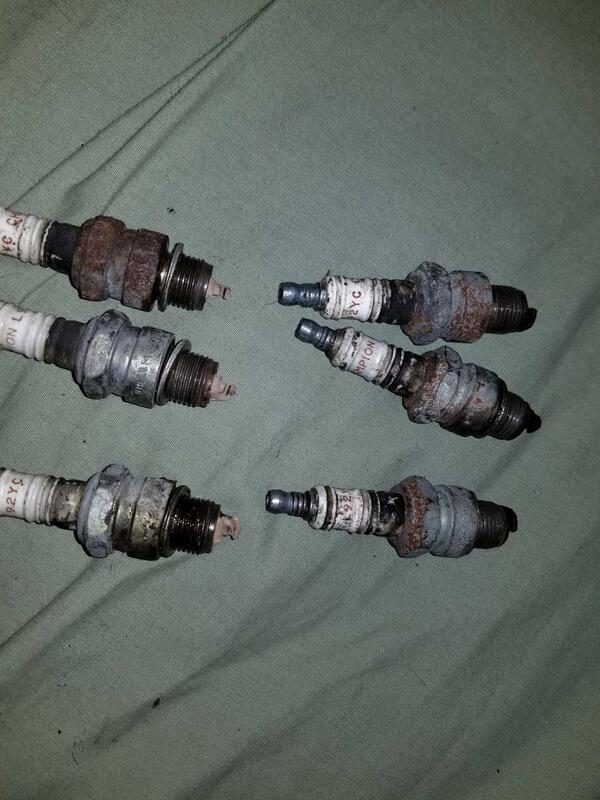 The plugs on the left developed this condition in under 12 months and probably less than 3k miles. If you run it much time at all - maybe 15 minutes in the highway after you resolved the problem they will clean up. Those on the left may have had a bunch of oil on then that has burned off and left those deposits. I thought for sure new plugs would fix it. I'll report back in when I clean out the brand new carb and swap the gas. So I seafoamed the carb and it died naturally, I went to start it and it coughed a huge white cloud unlike the standard blue that seafoam normally has. I took it around the block twice. For about 20 seconds it was perfect. Now I've pulled the carb and noticed some differences. There is a tube that extends upwards near the venturi cluster that my new carb doesn't have. The port for this is down next to the throttle. What does this do? I also found a bunch of black specs in the float bowl but the passages are clear. I reckon this is still causing a problem. The main jet doesn't have a gasket around it. Will this cause flooding? Edited 1 time(s). Last edit at 02/06/2019 10:44AM by MattNall. Main jets don't use gaskets. Pictures would really help us help you. I linked a picture in my previous post. If you zoom in close you can see the old (clogged) carb body and the new on I put on, that is still attached to the car. What specifically do you need a picture of so that I know what to take? The tube and where you are thinking a gasket is missing.